The Round Top, Texas, you know and love recently rolled out a new look — a style that gets to the heart of who we are as a town. If you’ve made it to our blog, you’ve already caught a glimpse of that updated feel, but we’d like to dig in a bit deeper. Hold on to your hats, folks. Here’s what it’s all about. The first thing you’ll notice is a brand-new tagline, “Big Time Small.” This touches on all the ways we’re living small-town life to the fullest. Our little Texas haven offers all the benefits of the big city, without the hustle, bustle and headaches. It’s record-breaking antiques shows and cozy back porch conversation. It’s fine dining with a side of pie. It’s HGTV celebrities, one-of-a-kind shopping and all the hometown charm you can handle. It’s a place like none other, and for 90 of us, it’s home. We pair that message with an airy, modern feel and big, beautiful photos taken right here in town. (After all, who needs stock imagery in a place this picturesque?) This whole shindig is about giving people a true taste of how we’re living the good life in Round Top, Texas — and inviting them to come enjoy it themselves. The initial rollout is just the beginning. Be on the lookout for other exciting updates — new versions of this very website, annual events that are bigger and better than ever, the list goes on and on. 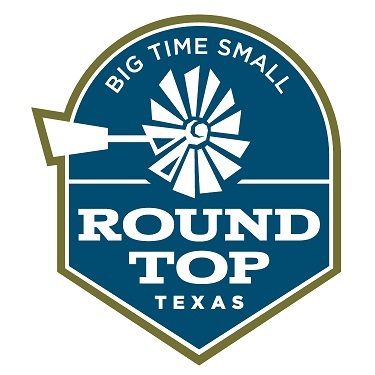 We hope you’re as excited as we are about this new chapter for Round Top, where we’re proud to be big time small.